Up To You! is a delightful journey about creating your dreams come true! 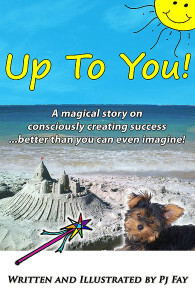 Join Pj, and her little dog Charlie, on the beach building sandcastles when the Sun beams brightly and speaks to them. The Sun tells them how much they are loved, and along the way, shares the secrets to consciously creating happiness and fulfilling your heart’s desires. Also joining in are a friendly wizard, his cute baby dragon and 7 charming animal friends, all helping you to discover the simple way to create the life you want! Based on true experiences, ancient wisdom, and higher Divine Intelligence, this is a story you will want to read over and over again; each time gaining new insights and many ‘a-ha!’ moments as you realize the depth and magnitude of this ‘Light’ read.